NAWALPARASI, April 4: TRaj Brewery Pvt Ltd has started commercial production of German beer Warsteiner in Nepal. 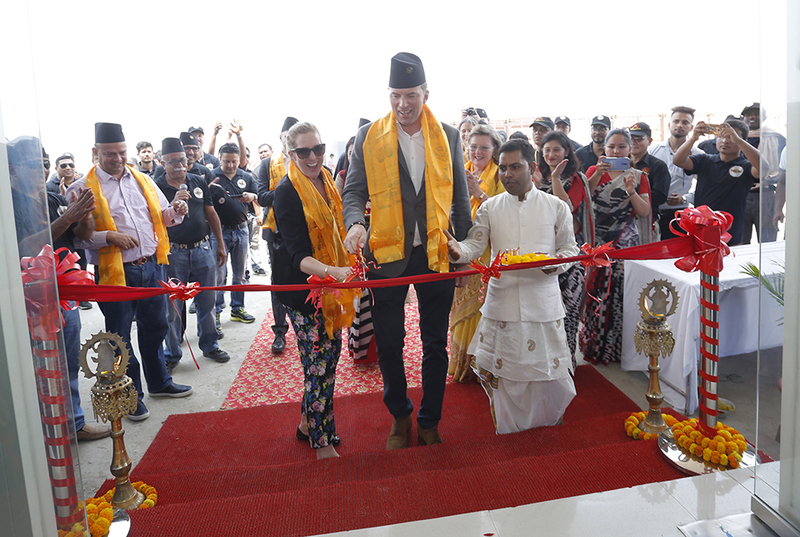 Catharina Cramer, the owner and president of the board of Warsteiner Group, inaugurated the brewery plant amid a ceremony held in Nawalparasi on Wednesday. Addressing a press briefing following the inauguration of the brewery, Cramer said that the group is proud to expand its products to Nepal. "We are not only looking growth here, we also want to win the hearts of Nepalis through our product," added Cramer, explaining the partnership between two family-owned corporations for licensing the German beer brand to Raj Brewery -- a sister concern of Jawalakhel Group of Industries (JCI). JCI, which is known for production of various liquors including Ruslan Vodka, has forayed into the brewery with the production of German beer. Raj Bahadur Shah, the managing director of Raj Brewery, said that the brewery chose Warsteiner after tasting over 100 beer brands in the world. According to Shah, the combination of modern and state-of-the-art factory, quality raw materials imported from Germany, and experienced brewing team would ensure the production and supply of true and authentic German beer in the Nepali market. According to Shah, all raw materials, including malt, hops and yeasts, are imported from Germany to make sure that the high quality and true flavor of German Warsteiner beer is not compromised. "Except water, all raw materials will come from the same suppliers of Warsteiner Group in Germany to make sure that the taste and quality of the beer in Germany and Nepal do not have any difference," he added. Warsteiner Group representatives present in the inauguration and press briefing said that the purity law of the Germany will also be followed in Nepal. Only malted barley, yeast, water, and hops are allowed as the ingredients of the beer under the Germany purity law, they added. All licensees, including Raj Brewery, have to follow the same standards of material and procedure as followed in the brewery of Germany to maintain the same quality, said Shah. The beer will be available at Rs 295 per bottle (maximum retail price) in the Nepali market. The production of Warsteiner beer also coincides with the celebration of 60 years of relationship between Nepal and Germany. Claudia Hiepe, deputy chief of mission of the Embassy of Federal Republic of Germany in Kathmandu, said that business partnership at the private level would help in strengthening economic ties between the two countries. "This partnership is an example to show that there is a lot of potential in Nepal for foreign investment," she added. According to officials of Raj Brewery, the brewery was established with an investment of US$ 35 million. "Due to overwhelming responses that we have received in the market, we are already mulling over expanding our production,” said Shah.